While you may take the easier method and make use of trendy pre-built websites, you may also make one from scratch to have more freedom over the design of your website. On this page, we have listed down some of the best Web builders that you can download off the Internet. With these choices that we are offering, you will need to assess your own skills and knowledge to determine whether or not they are enough to get you through these programs and help you create your own website. We have seven Web builders listed below, and if you want to check them out, then go ahead and scroll down. Wix is a freemium online Web development software that is cloud-based, which allows users to create HTML5 and mobile websites in the easiest way possible. This software can even be used by inexperienced Web developers, since this features simple drag-and-drop tools similar to those used in Dreamweaver. As mentioned earlier, Wix is a freemium software, which means you can already enjoy most of its Web development tools for free, but if you choose to connect your website to your own domain, then you will have to upgrade to the paid premium package. Other advantages with having the premium package includes the ability to remove ads, have extra data storage, and more data bandwidth. 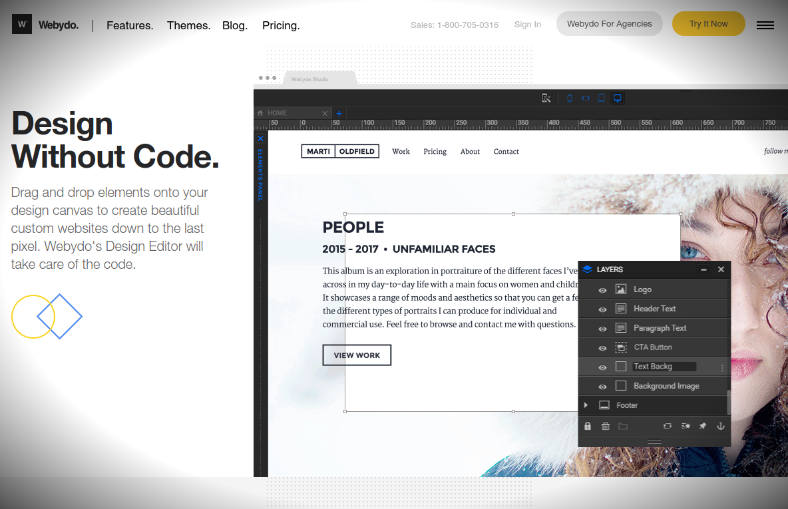 For awesome themes that you use for your website, check out our list of cool website themes and templates. WordPress is an open-source tool that is based on PHP and MySQL, and this is free to use for all individuals and even businesses. This is commonly used as a blog software, content management system, or a content management framework. This tool has its own Web template system using a template processor, and allows you to install different themes that you can switch back and forth to. WordPress was developed by Matt Mullenweg and Mike Little of the WordPress foundation and was first released on May 27, 2003, with the most stable version released on August 20, 2017. According to surveys, as of early this year, there have been an estimated 27% of the top ten million websites that are using WordPress, and there are around 60 million websites all over the world that are being supported by this CMS tool. 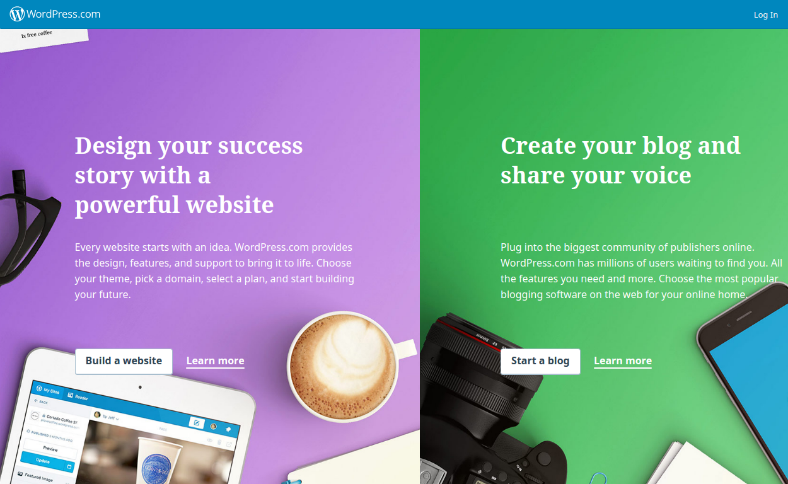 For themes that you can apply on your WordPress website, check out our samples of the best WordPress themes and templates. 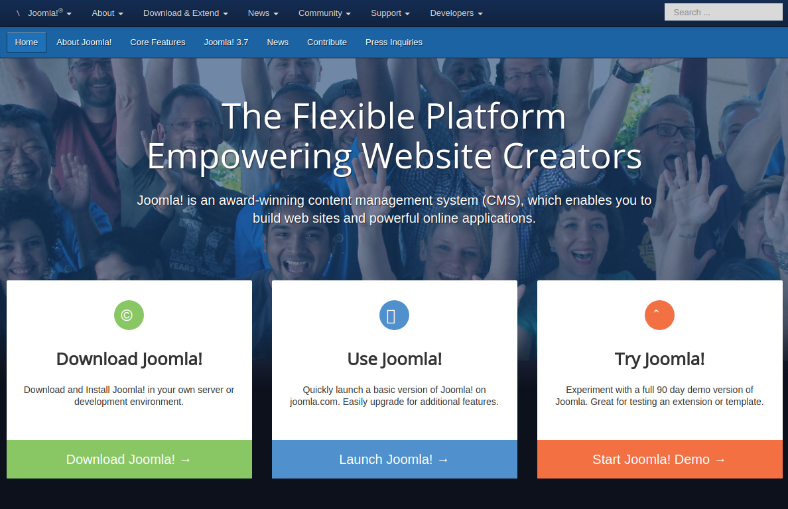 For another free-to-use and open-source CMS tool, Joomla may be another good option for publishing Web content. It was developed by The Joomla Project Team led by Andrew Eddie and had its initial release on August 17, 2006. Joomla’s most recent stable version—which is version 3.7.5—was released on August 17, 2017 and is still written in PHP. Joomla is mainly used as a content management framework and system, with other features including caching, blogs, and RSS feeds. As of late 2016, there are over 7,800+ official extensions available directly from the Joomla directory, and this CMS tool has already garnered around more than 80 million downloads since its initial release making it the second most used CMS on the Internet, with the first being WordPress. If you’re looking forward to creating a single-page website out of Joomla, you may want to check out our samples of one-page Joomla themes. Mobirise is a free-to-download offline website builder that can be used for both Windows and Mac computers. It is completely free for both commercial and non-commercial use, and you may be able to enjoy the entirety of its features without limitations. 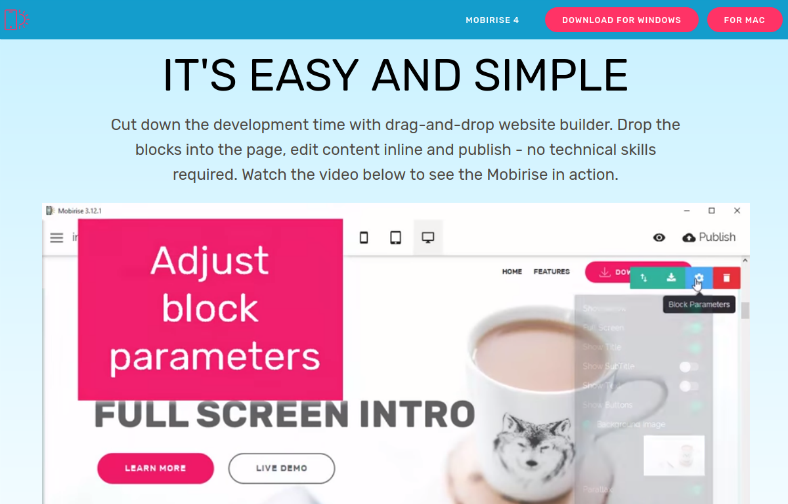 Mobirise is perfect for both the experienced and the novice Web designers with its simple-to-use drag-and-drop features that allows you to make a full website with just a few clicks. Mobirise is one of the easiest website builders that you can find on the Internet, even the installation process takes only a few steps; you just need to download and install the software, and you are good to go. With this simple software, you are already able to build both small and big websites and its landing pages, portfolios, and promotional sites. To provide you with ideas on what to apply on your website, you may refer to our list of the best sources of Web design inspiration. 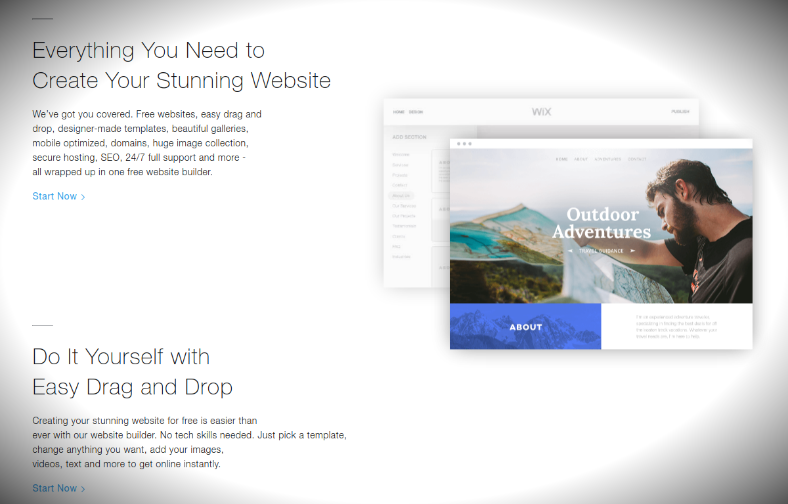 Webydo is a cloud-based website builder and Web hosting software that enables its users to make HTML5 websites without having to write code. This software makes use of WYSIWYG principle, or in other words, works in real time, allowing developers to already see the end result while still editing the website, and all this is done directly on the browser. The interface of Webydo works as a canvas, wherein you can drag and drop different elements onto the canvas. Webydo was founded in 2012 by Shmulik Grizim and Tzvika Steinmetz, and was even included by Microsoft as part of the twenty most innovative companies upon its initial release. Their goal was to let people be able to make their own responsive websites without the need for coding. When dragging and dropping elements onto the design, the software itself generates the code for you so you won’t have to worry about it anymore. As of August 2017, around 240,000 businesses have created websites with the use of Webydo. To even provide you with convenience in making your own website, we also have a collection of easy website themes and templates available for download. 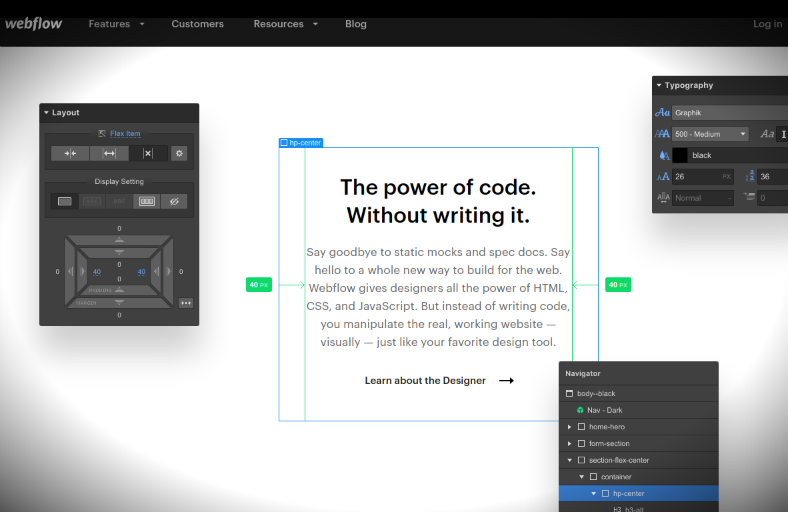 Webflow is a cloud-based SaaS tool built for designing responsive websites without the need of writing code. This tool was launched on August 5, 2013, with its headquarters located in San Francisco, California. With its professional drag-and-drop features, even those individuals without coding knowledge can make professional-grade websites, allowing them to work on multi-level aspects of Web distribution and development through a visual editor. 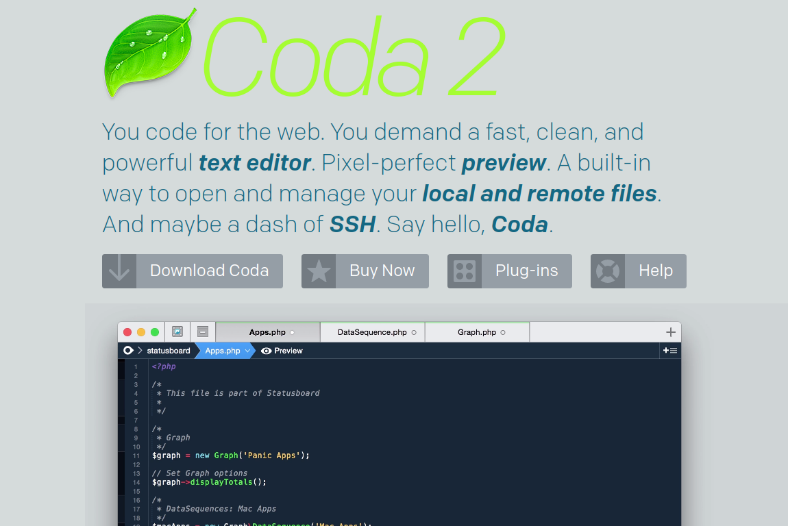 Coda is a Web development software by Panic Inc., which is exclusively for the macOS only. It was first released on April 23, 2007, with its most recent version (2.6.6.) released on June 5, 2017. It is a commercial and propriety application, which means you will only be able to enjoy its full features during its 7-day trial, after which, you may be required to pay a fee before you can continue using the software. This software has a lightweight version developed for the iPad, called Diet Coda, which was released on May 24, 2012. Though Coda is geared more toward professional Web developers since it requires you to write code, but the advantages of using Coda include having a powerful and organized text editor, an excellent and accurate preview system, and a convenient way to manage your files, both local and remote. Using Coda, you may still apply some cool Web designing concepts to your website to make the most out of it. During its initial release in 2007, Coda was awarded as the Web building software with the Best User Experience, though since 2014, you won’t be able to download this from the Mac App Store because of certain sandboxing limitations. For a source of inspiration, you may also want to check out the top ten Web design trends for the year 2017.